I have been wanting a mobile work bench for some time, (by mobile I mean if we ever move it can go with, not built in to the wall) Also wanted something that would stand up for years to come and possibly one of my sons would like to have when I’m no longer capable. It is 60” X 25” X 39” and has three drawers. It is made from primarily Red Oak, with bits of White Oak in the mix. I laminated the legs and the top. (2.5” thick with 3/4 ply base, hoping to prevent sag overtime). The top drawer hold my plans so they are not in the way during build by easily accessible. The oak is what the lumber mill calls furniture frame stock has a rustic look. I use this same stock on my model projects just cut around the defects. This does generate waste, but $250.00 for 700 board feet is a good deal to me. Only down size is I have to by in bulk (pallet) and cannot be selective. I bet it would last for a long time, realy looks sturdy. Very nice legacy to leave for your sons. 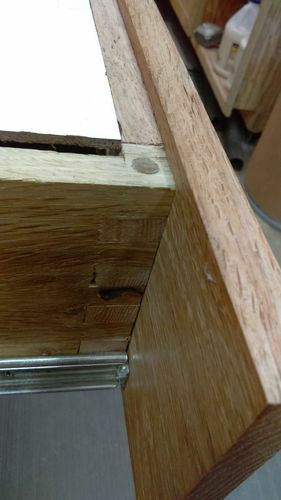 Forgot to mention that this was my first time to make box joints. I added a dowel for added strength, probably over kill. Bench is also coated in Boiled Linseed Oil. Looking great! I hope you will have a lot of pleasure from it. This workbench is very nice and a fine addition to your shop. Out of curiosity, how do you account for the plywood not moving and that big slab of oak moving probably 1/4 inch with the seasons? Won’t the plywood actually make it warp more? kryptx, i just used what I’ve heard that plywood is less likely to expand/ contract then hard wood. Plywood is made from thin sheets laminated together in opposite grain patterns to maximize strength and minimize movement. Could be wrong, but my workshop is temp controlled and I haven’t had a problem with other builds. Well done, a man needs a good work bench. I hope that bench brings you years of service and a lot of joy. It looks plenty sturdy and just the right size for the area. Looks great and must be a great addition to your shop. Thanks for sharing. Great looking, nice features, and appears to be sturdy! That second drawer is the best, I store my shop bought supplies in large narrow plastic crates; your drawer setup is the best….might have to organize a visit..